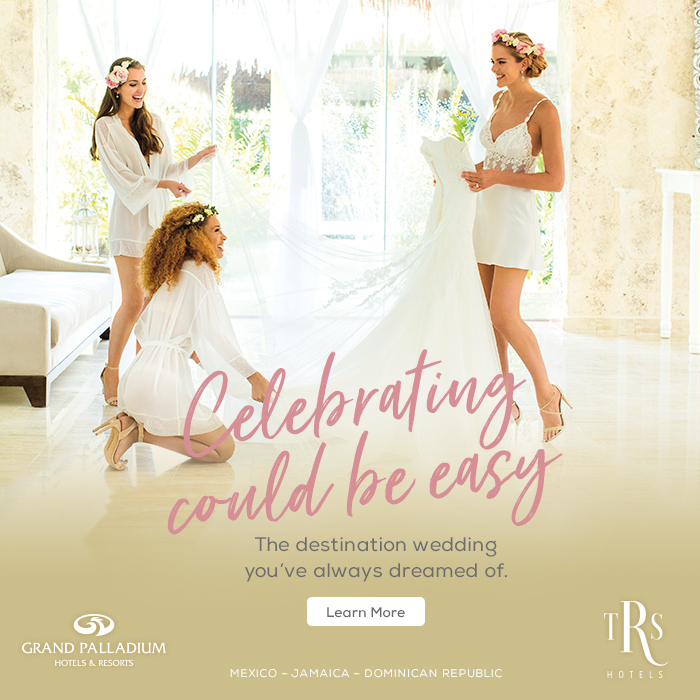 Selecting the attire for your destination wedding is an important step in setting the tone for the overall look of your big day. Your gown should always reflect your individual style, as well as the aesthetic and formality of the wedding. Identifying the theme of your wedding requires inspiration. 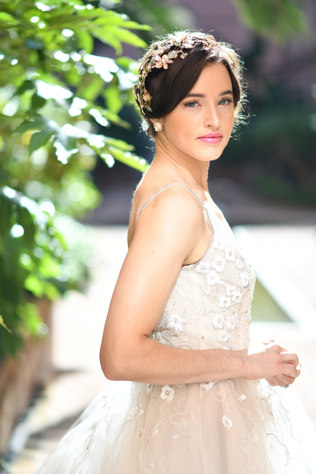 I like to recommend that you use your venue as a muse for your wedding fashion. The level of formality, the color and even the fabric should all be influenced by where your nuptials are taking place. This photo shoot was done in iconic Venice, Italy. When selecting your gown, take into consideration the climate of your wedding location. Fabric weight can be an important factor if you are getting married in a tropical location. Some fabrics to consider for a hot, humid climate are organza, chiffon, tulle or lace (particularly, Chantilly lace). Brides think they need to avoid a ball gown or fuller silhouettes if they are getting married in a warm climate. This is not the case, as long as the weight of the fabric is appropriate. Another option is to wear a fuller silhouette for the ceremony and then change into a sheath or short gown for the reception. If you are so in love with your gown that you can’t bear to take it off, then consider a detachable train or a full overskirt that you would wear over your gown for the ceremony and then remove for the reception. Selecting a wedding gown is often one of the first steps a bride takes as she embarks on the journey of her engagement. Finding the perfect gown is exciting, but can sometimes be confusing and overwhelming. There are a few things that should take place before you begin shopping. First, you should set a budget. Included in your overall wedding budget should be costs for your attire. This should include your gown, veil, shoes, accessories and alterations. When deciding where to shop for your dress, ensure that the bridal store has gowns that fall within your budget. Next, you need to have your wedding date and venue secured prior to shopping. It is next to impossible to select your gown when you can’t visualize where you will be getting married. Shoe selection becomes even more important when you are planning a destination wedding. Consider the location of your ceremony and where your photographs will be taken when deciding on your shoe style. If your destination has cobblestone streets or grass, you may want to consider a wedge or stacked heel. This style of shoe adds the height that many brides appreciate, but will also provide stability. If you are getting married on a beach, but want to change to a heel for your reception, have the seamstress hem the dress to your heel height. You will most likely have to hold up the front of your gown on the beach anyway. Wearing a veil is a very personal decision. It is important to keep your ceremony environment in mind when you are considering this option. If you are getting married in a location where it can tend to be windy, like on the beach or the top of a mountain, a veil, particularly a long one, might not be the best choice. While a blowing veil can be beautiful in photographs, it can be distracting during your ceremony. If there’s a chance you will encounter a breeze on your wedding day, but still want to wear a veil, opt for a lace or beaded trim veil. The novelty detail will add a little weight to the veil and it won’t be as apt to blow in the breeze. I never recommend shipping your gown or wedding attire. Call ahead to your airline and inquire about the size of the aircraft that you will be traveling on and ask if there is room in first-class or the flight attendant closet for you to store a garment bag. If you are traveling with a very large wedding gown, vacuum seal it! Turn the gown inside out, place it in a large vacuum seal bag intended for a comforter and remove the air. This will tremendously reduce the size of the gown and will allow you to fit it into a suitcase. When you arrive at the destination, hang the gown immediately. Be sure there is a steamer available for a final pressing on the wedding day. Beth Chapman is a stylist, author and owner of The White Dress by the shore, a couture bridal boutique on the Connecticut shoreline. The content above contains excerpts from her soon-to-be-released second book that she co-authored, The White Dress Destinations. Photography: Justin & Mary, Styling: Beth Chapman Styling, Beauty: d.d. Nickel, Venue: Hotel Excelsior Venice, Fitted Lace Gown: Made with Love Bridal, Black Gown: Romona Keveza, Blue Gown: Sareh Nouri, Champagne Gown & Veil: Hayley Paige, Jumpsuit: Theia, Headpieces: Maria Elena Headpieces, Hat: Bijou Van Ness & Earrings: The Something Old Collection. 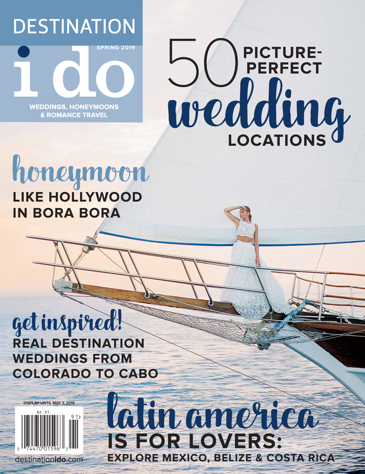 It's not easy to find the right companies to make your destination wedding planning easy. When it comes to invitations and stationery - that can be even harder - until now. It wasn’t easy, but we rounded up our Top 10 Destinations for 2013. Wording your invitations correctly can be tricky and a destination wedding offers different options.